Cylarne was a ruin in the Shivering Isles at the end of the Third Era, located on the Isle of Flame. It is the oldest known ruin in the Isles, and is rumored to be the original capital of the Shivering Isles. The ruins of Cylarne are home to the Cold Flame of Agnon, which is fed by the altars of Rapture and Despair. The Dark Seducers and Golden Saints constantly fought over controlling the ruin. 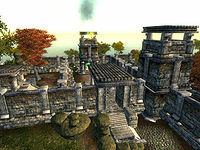 For in-game information on Cylarne, see the Shivering Isles article. ^ Loading screens in the Shivering Isles.